Remember - March is National Nutrition Month and time to "shape up your plate". So today, I'll offer some suggestions of how to increase your intake of vegetables. I think vegetables are the most important part of our diet. They give the body so many nutrients, vitamins, minerals, phytochemicals and impact the body in many ways - so it's always good to try and eat good quality vegetables. Eat a salad at both lunch and dinner. For one of these meals, you can make the salad the main entree, and for the other, you can have it as an appetizer or a side dish. Substitute raw vegetables for crackers or bread. For example, cut up carrots or cucumber or celery or bell peppers and serve those with hummus or cheese. Or instead of bread for a sandwich, put the filling on a slice of lettuce or kale or collard greens and wrap it up like a tortilla wrap. 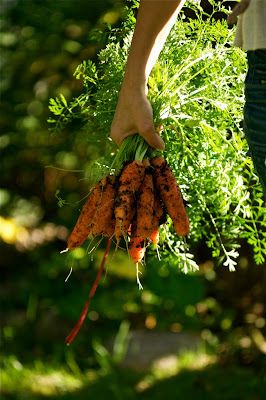 Join a CSA - community supported agriculture - and get a box of vegetables from a local farmer every week. Some weeks you'll have something you've never tried before, so it'll encourage you to be creative and try new recipes and ideas. Prepare more than one days worth of vegetables at a time. For example, if you are roasting vegetables to have with dinner one night - roast a full large pan and save the others for adding to soups or stews or reheating later in the week. When you plate your meal, give yourself double the amount of vegetables you normally would, and then select a smaller portion of something else - like meat - to compensate. Drink your vegetables. I ingest a large portion of vegetables by using them in green smoothies. The smoothies taste like fruit instead of vegetables so this method is great for everyone - even those who say they don't like vegetables. It's also an easy way to get vegetables into breakfast. Add extra vegetables to soups. If you are making your own soups or using prepared soups, just throw in a few more veg - like a handful of spinach, some mushrooms, some sun-dried tomatoes.There are lots of choices. Chop up vegetables to add to your grain dishes, for example cut up peppers, cucumbers, fresh leafy herbs, onions, chives, and add them to your rice or quinoa dish. Make a salad dressing out of veggies - blending an avocado with cucumber and lemon juice, for example. Keep a bag of raw veggies cut and cleaned in the fridge for quick snacks when you are hungry. Take the bag in the car with you when you drive if you are going to be late having a meal. Try growing sprouts indoors by a window. It's fun to watch them grow and then add them to salads and sandwiches. They are a great source of enzymes and so help digestion. Plant a vegetable plot in your garden - doesn't matter how small - can even be a single plant pot. You can also grow vegetables indoors if you don't have a garden.When you grow your own veggies, you'll enjoy them even more, knowing the care you've given them. Do you have other good suggestions? Now go eat some veg!